Dan Jenkins's His Ownself: A Semi-Memoir was published last week, which is as good an excuse as any to go spelunking through the back pages of one of our finest and funniest sportswriters. Here's a classic from the April 1985 issue of Golf Digest, anthologized in Jenkins's Fairways and Greens. Reprinted here with permission. Something mystical happens to every writer who goes to the Masters for the first time, some sort of emotional experience that results in a search party having to be sent out to recover his typewriter from a clump of azaleas. The writer first becomes hypnotized by the "cathedral of pines," down around the 10th fairway normally, then he genuflects at the Sarazen Bridge on the 15th, and eventually takes up a position on the Augusta National veranda, there to wait for an aging wisteria vine to crawl up his sleeve and caress his priceless clubhouse badge. It is a peculiar state of mind, a sort of sporting heaven in which the writer feels that if Bobby Jones could only waggle a hickory shaft once more, it would instantly turn him into F. Scott Damon "Ring" Hemingway. My own problem is that I still feel this way after 39 consecutive years of being on—or around—the Masters veranda. Where has the time gone? Yesterday it was 1951. I'm a college sophomore but a working journalist following Ben Hogan every step of the way to report on the color of Ben's slacks and the contents of Valerie's thermos to the readers of the now-deceased Fort Worth Press. Now it's all these years later but I'm still a fixture in my favorite area, the upstairs grill and balcony, wondering how much fun it would have been to have stood around there with Granny Rice and Bob Jones. As it is, I make do with an assortment of rogues: golfers, ex-pro football players, TV folks, poets, and other privileged souls who turn up in the clubhouse every year. I'm accused of having done a record amount of time in the upstairs grill and on that balcony overlooking the veranda. It's true that I've spent a lot of hours up there, but I can tell you that eggs, country ham, biscuits, red-eye gravy, a pot of coffee, a morning paper, a table by the window, and the idle chitchat of competitors, authors, wits, and philosophers hasn't exactly been a bad way to start off each day at the Masters all these years. That room, the upstairs men's grill, was once the interview area, so designated by those writers who wished to include quotes in their stories. Strangely enough, not every writer wanted quotes in his story 30 years ago. Many believed that their own observations were all their readers deserved. I was always a quote guy, trained by Blackie Sherrod, my mentor, a Texas sportswriting legend, to pick up the good quote, not just any old quote. So trained were a few other writers; such as my old friend Bob Drum, now with CBS, then with the Pittsburgh Press. In those early 1950s, we would ordinarily have the daily leaders all to ourselves upstairs at the completion of their rounds. Then more quote guys began coming out of the dogwood as the press corps of the Masters started to double, triple, and upward. And suddenly one year, Hogan and Snead found themselves being smothered on separate sofas while journalists stood, knelt, and shouted, "What'd you hit to the sixth?" . . . "How long was the putt on twelve?" . . . "Where was the pin on fifteen?" They practically swung from chandeliers. This was the first time I heard Ben use a line he would rely on again in the future. He said, "One of these days a deaf mute is going to win a golf tournament, and you guys won't be able to write a story." Cliff Roberts, the Masters chairman, observed this scene one day, saw things were getting out of hand, and ordered an interview room installed in the press building, which used to be a tent and then a Quonset hut before it became a structure to accommodate the largest number of journalists who attend any of the four majors. The problem these days with the interview area is that the interviews themselves have become so orchestrated by Masters edict that the interview area is quite possibly the worst place in Augusta, Ga., to look for news. Locker rooms and grill rooms are still the best places to find out things you don't know—at the Masters or any other golf tournament. I probably remember the 1954 Masters more vividly than any of the others. No doubt this has something to do with the fact that Hogan and Snead were involved, but it was only my fourth year there. I was still as awed as a teenager around a swimming pool of shapely adorables. I'm not willing to argue that the '54 event was the most thrilling of them all. The competition is too stiff. There was 1960, for example, the tournament where Arnold Palmer stabbed Ken Venturi in the heart with closing birdies at the 71st and 72nd holes. There was 1962, when Palmer birdied two of the last three holes to tie Gary Player and Dow Finsterwald, and then dusted them off in an 18-hole play-off during which the scoreboard operators showed no favoritism whatsoever when they posted "GO ARNIE" signs all over the golf course. And I couldn't overlook 1975, the year a trim, now-beloved Jack Nicklaus waged a Sunday birdie war—and won—over Tom Weiskopf and Johnny Miller. But 1954 was extra special. It was important, too, because Hogan and Snead, the two great players of the era, were in it all the way and wound up in a tie that forced a play-off. And the tournament proper was all the more exciting because of Billy Joe Patton, an obscure amateur from North Carolina. He very nearly won, and would have if he'd known how to play safe at the 13th and 15th holes in the final round. The last round began with Hogan in the lead by three strokes over Snead. Keep in mind that this was a Ben Hogan who had merely scored a Triple Crown, the year before by capturing the Masters, the U.S. Open, and the British Open, and this was a Sam Snead who had merely won the Masters twice and the PGA twice in the four previous years. We're talking legends here. Meanwhile, there was Billy Joe Patton, who had never won anything. Which I largely attributed to his fast backswing. Nevertheless, Billy Joe had stolen the hearts of the huge crowds, not to forget the press, by taking every conceivable risk on the course and babbling about it with everybody in the gallery. Billy Joe had surprisingly led through 18 and 36, but now he trailed by five—only not for long that Sunday. My friend Bob Drum and I, being quote guys, went out early with Billy Joe. Ben and Sam—and the tournament—would come along later. At the sixth hole, a par 3 that then had an enormous hump in the green (a mound that was once known as "the hill where they buried the elephant"), it will be to my everlasting embarrassment that I left Drum in the crowd behind the green and went to a nearby concession stand only seconds before Billy Joe struck his tee shot. The roar was deafening, similar to the kind we would hear for Palmer in later years, only this one trailed off in irregular Rebel whoops. Billy Joe had made a hole-in-one. "What did it look like?" I said, having rushed back to Drum. "It looked like a hole-in-one, whaddaya think it looked like?" Drum, a large man who was even larger then, has a guttural, Irish voice that has often been compared with the percussion section of the Ohio State band. "Did it go in on the fly, bounce in, roll in, or what?" I wondered. "It looked like a one!" said Drum, a man not known for his patience, a writer who cared little for detail in those days. "Here's the cup and here's the ball. The ball did this. That's a one!" He scribbled something on a pairing sheet. "Here, this is what a two looks like," he said. "That's not as good as a one. Okay? Let's go before Mush Mouth's gallery tramples us." Mush Mouth was every golfer or writer Drum ever knew who came from the Old South. I suppose I should interject that Drum and I became friends in the first place when we had been accidentally seated next to each other in the press emporium at my first Masters. Who could resist striking up a friendship with a man who would lean back and laugh so raucously, so often, at his own copy? I confess that he would catch me doing the same thing on occasion. We were to joke in future years that if Arnold Palmer had ever actually spoken the lines we dolled up for him, he could have had his own lounge act in Vegas. But back to '54 and Billy Joe. The amateur reclaimed the Masters lead that Sunday after he birdied the eighth and ninth holes, and by the time he reached the par-5 13th, the Masters was his to win or lose. We were standing within a few feet of Billy Joe at the 13th after his drive had come to rest in an awkward lie in the upper-right-hand rough. He pulled a spoon out of the bag, and Drum and I looked at each other. A wooden club from a bad lie in the rough to a green guarded by water? When you're leading the Masters? On Sunday? When maybe you can be the last amateur ever to win a major? When you've probably got Hogan and Snead beaten—and we've got Pulitzers riding on it? Billy Joe only grinned at us, and the crowd, and said, "I didn't get where I am by playin' safe!" "Great!" Drum said to me. "Where does this guy want his body shipped?" Billy Joe didn't hear my pal, not that it would have mattered. All week long, Billy Joe had heard nothing but his own muse. And he was too far away to hear his shot when it splashed in the creek. He made a seven. Minutes later, at the 15th he did it again—went for the green on his second. He found the water again, made a six. History books record that Billy Joe Patton played those two holes in three over par that Sunday, holes he could easily have parred by laying up, and he only missed tying Hogan and Snead by one stroke. With those pars, he would have won The Masters by two. Even touring pros are sometimes aware of historic importance. Many in the field stayed over on Monday to watch the Hogan-Snead playoff. Bob Jones and Cliff Roberts rode along in a golf cart. From tee to green, it was a clinic, but neither player could make a putt on those old scratchy but lightning rye greens. They used to say you could actually hear the ball rolling across the barren rye. Snead won with a two-under 70 to Hogan's 71, and the difference was a 30-foot chip shot that Sam holed from just off the 10th green. I lost $100 to Drum on the playoff, a $100 that neither of us had. Knowing he admired Hogan's game as much as I did, I later asked him why he had wanted to bet on Snead. "It ain't the Open," he had said, having outsmarted me again. While it's true that I missed seeing Billy Joe's ace, I wasn't always in the wrong place at Augusta. On the night before Art Wall Jr. birdied five of the last six holes to win the 1959 Masters, I ran into him in the lobby of the ancient Bon Air Hotel, once the only place to stay before it became a retirement home. The Bon Air was headquarters for everyone, just as the old Town Tavern in downtown Augusta used to be the only place to stand in line and try to bribe your way in for dinner. Art and I were making small talk that evening when he was recognized by one of your typical Augusta fans, a red-faced, over-beveraged Southerner in an ill-fitting blazer. "Hey!" the man said. "Aren't you Art Wall?" "Ain't you the fellow who's supposed to make all them hole-in-ones?" "Thirty or forty of them suckers? Something like that?" "It's up to thirty-four now," said Art, politely. "Thirty-four?" the man frowned. "Boy, who you tryin' to kid? Bobby didn't make but three!" 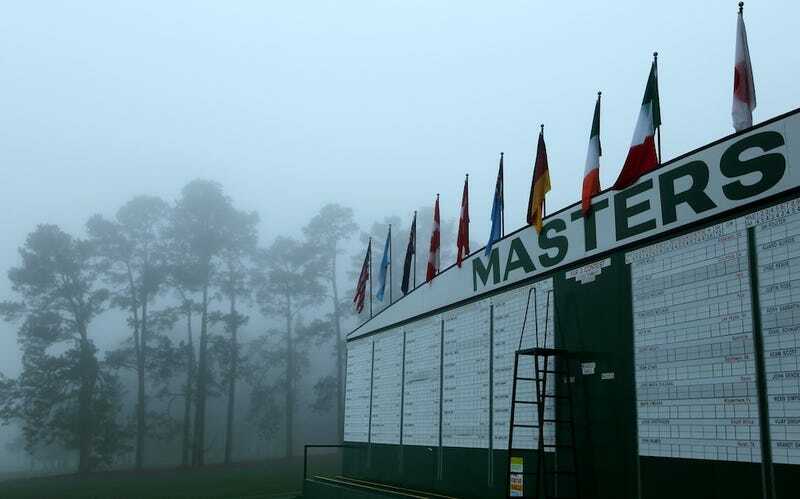 At a more recent Masters, I was lolling around on the veranda with Mike Lupica, a columnist for the New York Daily News. He's considerably younger than I—this was maybe his second Masters—and I guess I momentarily forgot that Mike is noted for his mouth. He was thumbing through the Green Book, the press guide, looking for lore items, when he said, "Your first year was fifty-one?" He started to count something. Then he said, "Do you realize your first year was only the fifteenth Masters they'd ever played?" I'd never thought of it that way. "I'll be damned," I said. And he said, "So how 'bout it, old-timer? Were the greens really that fast in those days?" I almost made the mistake of seriously answering him. Happily, a wisteria vine grabbed me around the neck and prevented it. Dan Jenkins is one of America's most acclaimed sportswriters as well as a bestselling novelist. A native Texan, he has spent a lifetime at the typewriter and computer. He might best be known for his 24 years of stories in Sports Illustrated and now Golf Digest. Three of his bestselling novels, Semi-Tough, Dead Solid Perfect, and Baja Oklahoma, were made into movies. His sportswriting has won him many awards. In 2012 he was inducted into the World Golf Hall of Fame—one of only three writers to be honored thus far—and was given the PEN Lifetime Achievement Award for Literary Sports Writing. He is also the 2013 winner of the Red Smith Award, the highest honor in his profession. Buy His Ownself: A Semi-Memoir on Amazon.